India’s #1 Enrich lipsticks are now in a matte finish for the first time. Add some lovely colour to your lips with the Lakme Enrich Matte Lipstick. Available in a palette of 20 vibrant and trendy shades, each of the Lakme Enrich Matte lipsticks gives you long lasting lip color. The shades are specially designed to give an even, luscious coat to your lips. The Vitamin E content nourishes your lips and makes them soft and supple. The lipsticks also contain olive extracts that replenish your lips while hydrating them. The high color delivery feature ensures that you get long lasting shine and color. 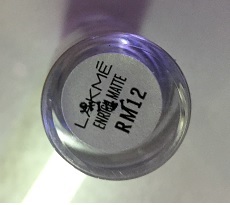 The Lakme Enrich Matte lipsticks do not drag while applying, and do not dry the lips. The lipsticks have a creamy matte texture that is comfortable to wear. The Lakme Enrich Matte lipsticks have the finish and color delivery of matte lipsticks, but the comfort of crème lipsticks. The packaging of the matte lipstick is no different from the Lakme enrich satin lipsticks. These lipsticks have same color body same thickness on the body and same outer packaging. The only difference is written on the body of the lipstick as matte. The lipstick comes in a transparent silver color packaging. One can see the color from the top of the transparent lid on the top of the bullet. The name/number of the shade is given at the bottom of the bullet. 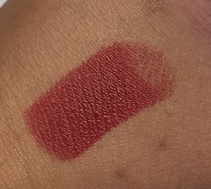 The texture of the lipstick is smooth and soft. The lipstick glides smoothly on lips and gives good color in single swipe. The lipstick is a matte and not drying on lips. The shade RM12 is matte brick red shade. The shade is very good and will look good on any skin tone. Actually, this shade is an ideal Indian skin tone red. This shade will look work both ways i.e. it can be daytime office wear kind of shade and it will work wonders for night parties. I am in love with this shade. This shade is highly pigmented but will completely cover the lips in single swipe. This lipstick does not transfer much, which is great. The lipstick stays for good 4-5 hours with eating and drinking in fact even after having a full meal this lipstick leaves stain on the lips. However, without eating or drinking I think this lipstick may last for more than 5 hours. Considering the price, this lipstick has very good pay-off. I could not place any cons as of now, may be later after more usage. However, if one I could say then that will be that; Lakme should have changed the packaging as one may get confused with Lakme Enrich Satin Lipsticks. 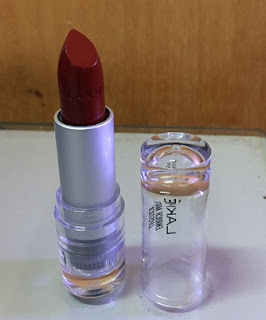 I think I am going to buy more shades in this range as I love lipsticks and this one is affordable and great in performance, hence I am definitely going to buy many more.